Whoo! Another gorgeous morning. I spent about 2 hours in the Grove, Glenview’s outdoor history and nature museum. I walked around quite a while looking for a view that was a little wild and woodsy, but with simple forms. The moon caught my eye. I followed the steps Laurel Daniel laid out in a recent post: block in, upright plane, ground plane, sky plane, refinement. Not sure why I feel so out of control painting outside. At one point I felt like I was mixing cake batter on the panel. The photo has a lot of glare. I may repost it later, but I’ve put off my chores long enough. 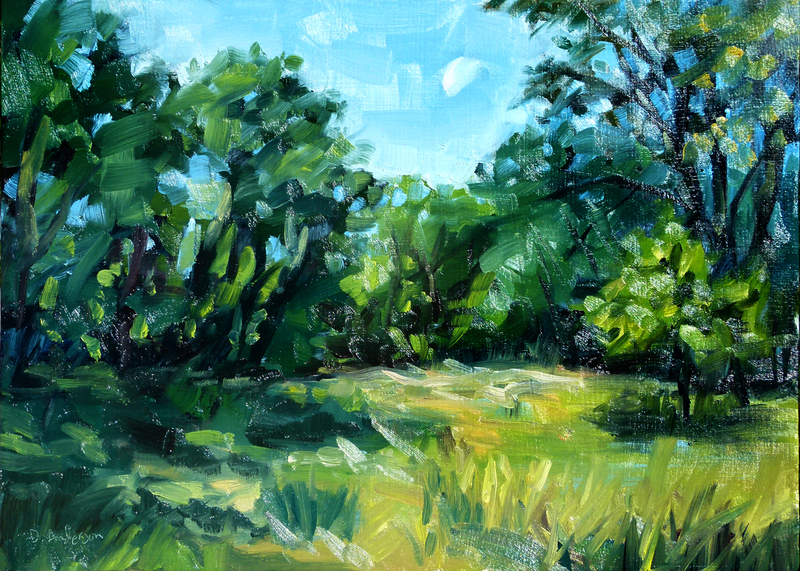 This entry was posted in landscape, oil, Plein air and tagged Deb Anderson, Glenview, Grove, landscape, moon, oil painting, plein air.